When I bake, my mind finds peace. There's something about baking that calms me down even when my mind tries vigorously to solve out things that aren't really ones it can solve. Maybe it has to do with the familiar ritual of measuring flour, butter, and sugar. Maybe it's the rhythmical pace of kneading dough. Baking calms me down like nothing else, gives me comfort, makes me feel whole again. Whether in moments of pure joy or of sadness, you can find me in the kitchen with a bowl in my hands and flour in my hair. I'm back at my most favorite kitchen window, my favorite spot to bake and take pictures. I'm kneading dough and quartering plums while enjoying the beautiful scenery; alps and cows. The light is, again, magical. Soft, clean, and welcoming. Perfect. 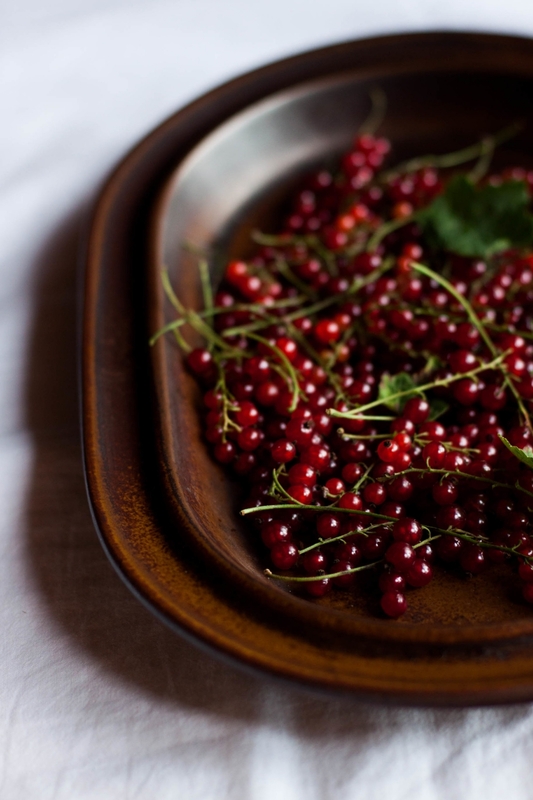 Prune plums, called Zwetschgen here, are in season from August to September. They are used to make one of my most favorite cakes, Zwetschgendatschi, a traditional plum sheet cake that is topped with lots of streusel or sliced almonds. 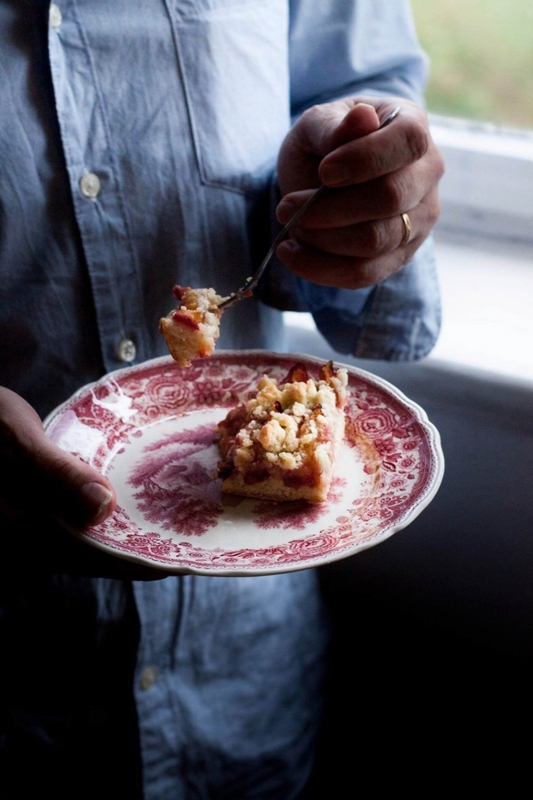 I belong to that range of people who always choose a slice with streusel; maybe it's because my beloved late Oma made it that way. A generous dollop of whipped cream is almost mandatory, although, to be honest with you I was too lazy to whip cream this time, so I enjoyed the Zwetschgendatschi plain. And you know what? It was luscious. This cake is basically the best thing you can do when you spot gorgeous prune plums at the farmers' market or have some sitting on your kitchen counter waiting for their destiny. The recipe yields one large sheet and is adapted from a handwritten note my Oma has given me years ago. It tastes just like hers did. This is not just a cake; it's an ode to her. If you prefer a thinner crust, make the dough I used in this Rhubarb Strawberry Datschi – the result will be a more sophisticated, delicate Datschi with a higher fruit to crust ratio. In a medium-sized bowl, combine milk and crumbled yeast. [If using instant active dry yeast, skip this step. Combine yeast with some flour and add to warm, about 42°C / 108°F, milk mixture just before adding the rest of the flour.] Stir until yeast is completely dissolved. Add sugar, salt, oil, and eggs. Whisk until combined. Gradually add flour and knead. Continue to knead and add flour until the dough comes clean off the sides of the bowl and doesn't stick to your hands. Note: You can make the dough in a stand mixer if you prefer. Shape into a ball and cover with a clean kitchen towel. Let the dough rise in a warm place for about 1 hour, or until it's almost double in size. Meanwhile, preheat the oven to 180°C / 355°F. Line a rimmed baking sheet with parchment paper. In a small bowl, combine flour, sugar, salt, and butter until you have a crumbly mixture. If not using immediately, put the bowl into the fridge until ready to use. With a rolling pin, roll out the dough until roughly the size of the baking sheet. Spread out on the prepared baking sheet and pull into shape. Arrange the plum quarters in slightly overlapping rows (tightly and cut side up) over the dough. Leave a rim of about 1 cm / 0.5". Sprinkle with sugar and some cinnamon. Sprinkle the streusel over the fruit. Bake for 25–30 minutes, or until the edges are dark brown. Let cool, cut into squares, and, if you like, serve with a generous dollop of whipped cream. The Datschi will keep for up to 3 days and is, in my opinion, at its best on the second day when the flavors have developed. Drumroll, please... My summer vacation started this week! Wohooo! I still can't get my head around the fact that someone is actually paying me for doing nothing. So for the next 4 weeks I get paid for sleeping in, eating strawberries and fresh peas by the handful, hanging out with friends and family, spending way too much time watching music videos like this one, staining my hands with the sweet juices of cherries, chatting with the lovely lady at the farmers' market, sitting on the porch enjoying a glass of chilled rosé, and watching the World Cup every single night. Absolutely no complaints. This occasion definitely calls for cake. So how about toscakaka? It's basically a classic pound cake topped with one giant Florentine. Pretty damn genius if you ask me. 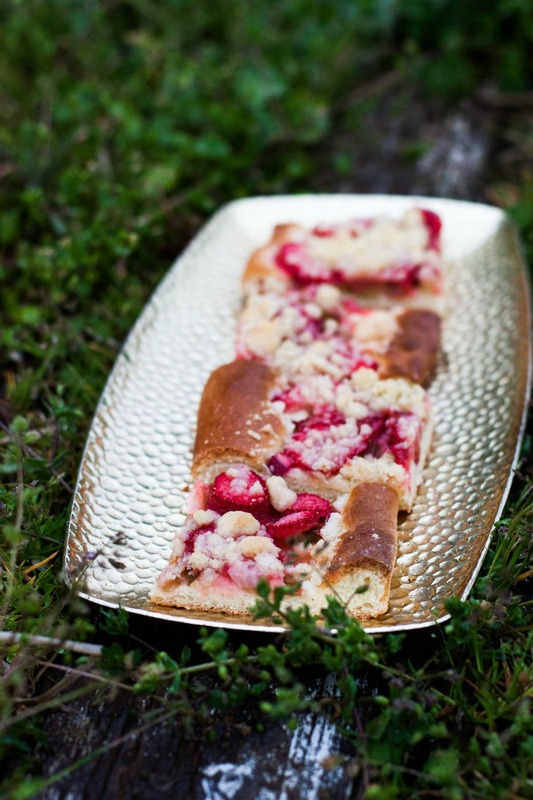 Not without reason is it one of the most loved cakes in Scandinavian baking. I'm not sure of its origin but already my great-great-grandmother, a known cook, baker, and author, baked this cake. The ingredients must have been rather expensive at that time so I guess it has been a treat reserved solely for the upper class. This cake is baked according to a family recipe. Toscakaka was my late great-grandfather's signature cake, and luckily he left a small note with the ingredients needed to recreate this treat. I've kept that small piece of paper like a gem for several years now, but somehow I've never actually made the cake. Maybe I feared screwing it up? Would I be able to make the cake taste as good as he did? Last week, I finally overcame my fear of failing. The cake came out perfect. I don't know if it tasted as good as the ones my great-grandfather baked but it was everything I could have asked for. A moist cake base and a crunchy caramel almond crust. I was proud of myself, and I'm sure he would have been too. This cake is highly addictive. I've made three cakes in one week. Yeah. Let it be summer vacation. Grease the cake pan (preferably springform). In a small bowl, mix the flour, salt, and baking powder. Set aside. In a bowl of a standing mixer, cream the butter and sugar together until light and fluffy. Add the eggs one at a time and beat until well incorporated. (If your batter breaks at this step, your eggs have probably not been at room temperature or you've added the eggs too quickly. Don't worry. The dough should come together once the flour is added.) Add lemon zest and about half of the flour mixture and mix until smooth. Gradually add the milk and finally the rest of the flour mixture and mix until you have a smooth batter. Pour into the prepared cake pan. Bake on the middle rack for 25–30 minutes or until risen, golden brown in color, and almost done (the cake will continue to bake once the topping is added but needs to be enough cooked to support the topping). Add the butter, almonds, sugar, flour, and heavy cream to a medium-sized heavy-bottomed pot. Keep your eyes on the cake. When the cake starts to look ready for the topping, start cooking the caramel almond topping (the topping comes together in less than 5 minutes). Over medium-high heat, stir until the mixture starts to bubble and thicken slightly. Remove from heat and pour over the pre-baked cake making sure that it's evenly distributed. I think it's easiest to pour the topping in the middle of the cake and, with the help of a spatula, gently spread into an even layer. Bake for further 10–15 minutes or until the crust is golden brown and bubbles. Cool for about 10 minutes, and run a knife around the edge of the pan to release the cake. Let cool on a wire rack. The caramel will harden as the cake cools down. Enjoy at room temperature plain or with fresh berries and some Greek yogurt or lightly whipped cream.